Since 2008, Premier Dental Care and Dr. Farshad Bakhtyari have been devoted to general, cosmetic, and family dentistry in Oak Hill, Virginia – near Reston Town Center. It is our goal to help restore and enhance the natural beauty of your smile. In our office, we employ state-of-the-art treatments and procedures that we know will result in beautiful, long-lasting smiles for you and your whole family. 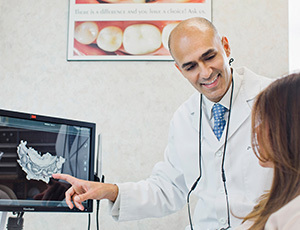 Dr. Bakhtyari and our staff are committed to a standard of dental care excellence that is personalized to meet the individual needs of our patients. We believe that our patients and their families deserve nothing less than a comprehensive oral care treatment plan. We make use of restorative and cosmetic dentistry techniques to achieve their optimal dental health. Should any dental emergency occur, we make every effort to see and care for you or your family member as soon as possible. In our practice, each and every team member is a true believer in preventive dental care and ongoing education. These are the keys to optimal dental health for our patients and success in our practice. We endeavor to provide dental health care services, as opposed to mere disease care. As professionals in the dental care industry, we know that routine cleanings, regular flossing, sealants, and fluoride treatments are beneficial in maintaining good oral health and in preventing dental disease. We also rely on thorough examinations to establish the overall health of your teeth and gums. 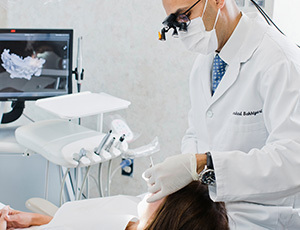 We perform oral cancer screenings at every recall appointment and take X-rays when necessary. As part of any comprehensive examination, a review of your medical history may also help us interpret your overall health, so please be prepared to discuss any medications you may be taking and any recent illnesses that may have impacted your dental health. As dental health professionals, we want all of our patients to know that we are a team of highly-trained and skilled clinicians. We take great pride in providing the care your family needs to keep smiling. Each of us is committed to ongoing education in the field and practice of dentistry. Dr. Bakhtyari and our staff regularly attend lectures, meetings, and dental conventions. We aim to stay informed of new products, treatments, and techniques. We ask our providers to brief us on the latest developments in equipment so that our office can provide state-of-the-art dental care. In addition, our practice is a member of the American Dental Association, the Northern Virginia Dental Society, and the Virginia Dental Association. These key memberships also help us stay abreast of the changes in our profession. In the dental care industry, you build a foundation of trust by treating your patients as unique individuals with specific needs. This foundation is vital to our success. We understand that some patients are uneasy about dental visits and we strive to make a difference by providing a relaxing and positive experience for each and every patient that comes to us for dental care. You can be assured that Dr. Bakhtyari and our entire team is dedicated to providing you with outstanding, personalized care and to make your every visit as comfortable and rewarding as possible. We thank you for allowing us to care for your dental needs. We look forward to serving you in the future.